Clean, simple lines distinguish this chrome wall sconce design from George Kovacs. Illuminate your home with the soft warm glow of this contemporary wall sconce from the Saber collection by George Kovacs. The sleek chrome finish gives it a modern look, while the cased etched opal glass column appears stately and grand. Please note this fixture can only be installed with the light pointing up. 12 1/2" high x 4 3/4" wide. Extends 4 3/4" from the wall. Weighs 1.43 lbs. Round backplate is 4 3/4" wide. Glass shade is 9 1/2" high x 2 1/2" wide. A George Kovacs wall sconce design. Great for a vanity bath areas or for home theater use. Can only be installed with the light pointing up as shown. I liked the simple classic contemporary lines for a bathroom. Can this be installed light down? BEST ANSWER: Hi Pat - No, this light can only be installed pointing up. So this takes a standard size base for the bulb and is a longer narrow shape? BEST ANSWER: Yes, the recommended bulb for this sconce is a T10 shape bulb with a standard base. More information can be found below. Can this be used in a damp area like a bathroom? BEST ANSWER: Sure, this can be used in a bathroom. If the area is well ventilated with no buildup of steam or condensation, and if it is not installed adjacent to showers, it should be fine. Does this Kovacs light come in a brushed aluminum finish? Should I get frosted or clear bulbs for this sconce ? BEST ANSWER: The glass is frosted enough that either the clear or frosted bulbs will work! It is a matter of preference. We put clear bulbs in and it looks lovely. The lamp glass is frosted. The bulb cannot be seen and just the light from it glows through. Either are fine, depends how bright you want it to be, I use clear. 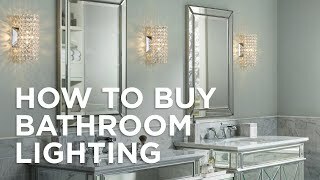 I used the fixture for a bathroom remodel on either side of the vanity mirror. 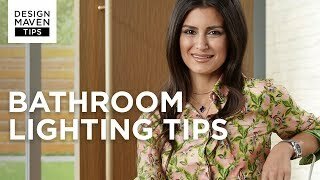 The fixtures are great because the cast an adequate amount of light at the right level and are really beautiful to add as and eclectic piece in a bathroom with some traditional elements. I have the sconce in my bathroom above my medicine cabinet, and I love how it looks. It was exactly as pictured, and installed easily. Very helpful customer service, speedy delivery! This is a great light but buy it new. I was in a time rush so I bought 1 new and 1 floor model. Even after voicing concern over getting all the necessary hardware Lamps Plus still shorted me the mounting bracket.